30.07.17 07:17 Transfer Sent Payment: 150.00 USD to account U13315446 from U1294xxx. Batch: 183344868. Memo: Shopping Cart Payment. ATOMIC HORIZONS LTD.
31.07.17 11:09;Account;Receive;Received Payment 7.8 USD from account U13315446 to account U1294000. Batch: 183442361. Memo: API Payment. 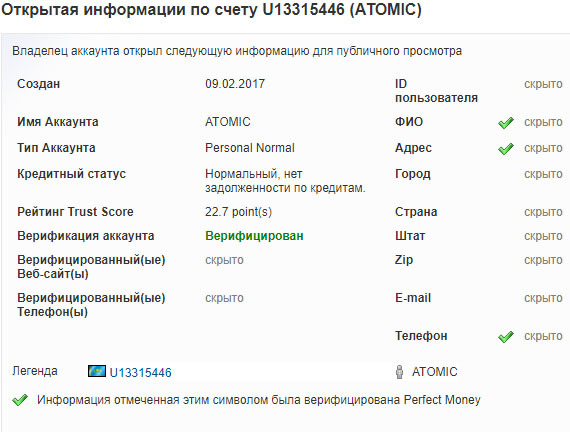 ATOMIC HORIZONS LTD.
31.07.17 18:09;Account;Receive;Received Payment 0.8 USD from account U13315446 to account U1294000. Batch: 183478172. Memo: API Payment. Auto. The amount of 3.12 USD has been deposited to your account. Accounts: U13315446->U726..... Memo: API Payment. ATOMIC HORIZONS LTD.. Date: 09:19 01.08.17. Batch: 183693732. 01.08.17 10:24;Account;Receive;Received Payment 7.8 USD from account U13315446 to account U1294000. Batch: 183808247. Memo: API Payment. ATOMIC HORIZONS LTD.
01.08.17 07:11;Account;Receive;Received Payment 0.8 USD from account U13315446 to account U1294000. Batch: 183514490. Memo: API Payment. Auto. The amount of 1.56 USD has been deposited to your account. Accounts: U13315446->U726..... Memo: API Payment. ATOMIC HORIZONS LTD.. Date: 08:09 02.08.17. Batch: 183893180. 02.08.17 13:16;Account;Receive;Received Payment 0.8 USD from account U13315446 to account U1294000. Batch: 183916570. Memo: API Payment. Auto. 02.08.17 12:55;Account;Receive;Received Payment 7.8 USD from account U13315446 to account U1294000. Batch: 183915024. Memo: API Payment. ATOMIC HORIZONS LTD. The amount of 1.56 USD has been deposited to your account. Accounts: U13315446->U726.... Memo: API Payment. ATOMIC HORIZONS LTD.. Date: 08:55 03.08.17. Batch: 183989519. 03.08.17 10:02;Account;Receive;Received Payment 7.8 USD from account U13315446 to account U1294000. Batch: 183994247. Memo: API Payment. ATOMIC HORIZONS LTD.
02.08.17 20:36;Account;Receive;Received Payment 0.8 USD from account U13315446 to account U1294000. Batch: 183954313. Memo: API Payment. Auto. The amount of 1.56 USD has been deposited to your account. Accounts: U13315446->U726..... Memo: API Payment. ATOMIC HORIZONS LTD.. Date: 14:36 04.08.17. Batch: 184110900.